Fabulous crafting kits for paper crafters! Card kits, Mini Album Kits and More! Card Kit: Follow Your Bliss Release! You've been waiting for it! A new and fabulous crafting kit that is the perfect way to get your creativity revved up. We're thrilled to release our latest Maya Road Card Kit that's full of stunning of papers, colors and embellishments. It's called Follow Your Bliss and is a carefully curated mix of beauty for your creative journey. Follow Your Bliss is our latest stunning card kit and we're excited to share it with you today. Stunning colors, elegant and on-trend prints, touchable textures and beautiful blooms are what you'll find in each kit. All the papers, stamps, flair and fun exclusives make it easy to just open the package and get creating. Our kits are limited edition so if you want it, make sure you purchase it right away. Quantities are limited. We think you'll agree it's a pretty amazing kit and what's even more incredible is the price! Full of more than $52 of supplies, we're selling it for only $25.49 plus shipping ($6.00 in the US). We're excited to have put together such an amazing kit of fabulous product. Each kit has been designed for versatility, amazing value and ease of use. It's a wonderful way to jump-start your creativity. Just open the package and get to it. If you're looking for extra inspiration we have a kit gallery full of ideas to get you started. Check it out here. Before you buy, you may have some questions and you can find the answers on our FAQ's page. As an additional bonus we have a coordinating digital die cutting file to share with you. It comes in both PNG and SVG formats to work with the majority of the electronic die cutting machines on the market. Our Follow Your Bliss Kit Add-ons. So many of the products in the Follow Your Bliss Kit are just so fabulous we thought you might want to be able to purchase a few extras. Purchase any or all of the add-ons at the same time you purchase the kit and we'll mail them at the same time with no additional shipping charge! These sweet tassels are a stunning mint color and feature beautiful shiny gold tops. They make amazing crafting accents and also look darling on a necklace chain. The mint color in this add-on is lighter than the tassels included in the kit and the colors mix and match perfectly. This add-on is for 8 mini mini tassles and are a hot design trend right now! Each kit comes with one paper pad included but if you like to create in bulk, an additional pad will keep you crafting additional projects. Purchase two and you'll have no excuse for hoarding! These sweet wood stars are the perfect accent for some many things. Use them just like sequins to add a splash of tiny accents over your project. The texture of the wood stars make them perfect for both feminine and masculine style designs and would these be absolutely darling in a shaker card?! Our exclusive Maya Road flair adds, well, the perfect flair to any project. We adore these beautiful button style accents and they are always a very popular add-on in our kits. This add-on gives you four additional pieces of flair, two of each style. We love our exclusive wood tokens that we created to coordinate with our kits. This add-on is includes four pieces of our Enjoy wood token. Wouldn't these be darling on a scrapbook page, a gift card or even a handmade gift?! These sweet metal clips are #fun! Who would have thought this humble symbol would become so popular and trendy? Add these sweet hashtag clips pretty much anywhere you like! They make great page markers on planners, and great additions on cards and other paper crafts. This add-on is for one package of metal hashtag paper clips - 6 in total. Well. These are a hoot! Add in some cool and sassy fun with these sweet owl clips! This add-on is for one package of clips - 12 in total! Oh la la! This pink pearl trim is so pretty and adds a great touch of class and beauty to any design. It's great for borders and edges and even flower centers! This add-on is for 1 yard of trim. We love seam binding and the color of this aqua trim is stunning! This add-on includes 2 yards of seam binding wrapped around a sweet wood spool that you can use for ribbon storage or as a project embellishment. Hoop it up with this sweet 6" diameter embroidery hoop. Perfect for altering and paper crafting this, hoop makes great home accents! Date stamps are a sweet way to date your art work, photos, journaling etc. We love how they add a sweet retro touch to designs and are practical as well! This add-on is for one date stamp. Ink it up with any color of ink you own! If you're looking for samples of what you can create with this kit, look no further! TWO different designers have created unique card designs to inspire you. Simply click on the following photos and you'll be linked right to their coordinating galleries. Each designer has written full instructions to complete each project. Below you'll find links to the PRINTABLE PDF files that make this kit into a class for you! This kit will ship starting July 2nd so you'll be able to get started right away! Click here for printable PDF of Julia's full project instructions! Click here for printable PDF of Amy's full project instructions! So what's YOUR story? Write On is a great place to start sharing it! Check out our latest kit! It's full of sweet creative bliss! Create a beautiful vintage album that's full of love! Check it out! We've brewed up one fabulous card kit! Check it out! Get festive with our stunning new holiday kit! 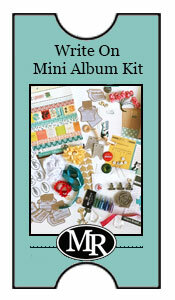 Take a creative journey with our latest mini album kit! This latest kit is sure to help you create many works of heart! 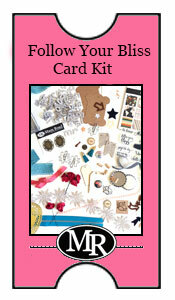 Check out our latest card kit! It's too beautiful for words. It's time to get ready for the holidays! Check out our Sparkle & Shine kit for some beautiful creations. Fall in love with this absolutely darling Classic Card Kit! Chronicle your amazing memories with this fabulous kit! Set off to a creative destination! Say HELLO to this bright and beautiful kit! Start off 2014 with our latest creative card kit! Get your merry on with our latest kit!